SPARTANBURG, S.C. — QS/1 this week launched SharpRx, which the company described as the next generation of pharmacy management software. SharpRx brings touchscreen capability and an intuitive design and layout. The pharmacy technology provider said SharpRx gives small chain and independent and pharmacies a more efficient way to fill prescriptions and bill third-party insurance, in turn enabling faster customer service. 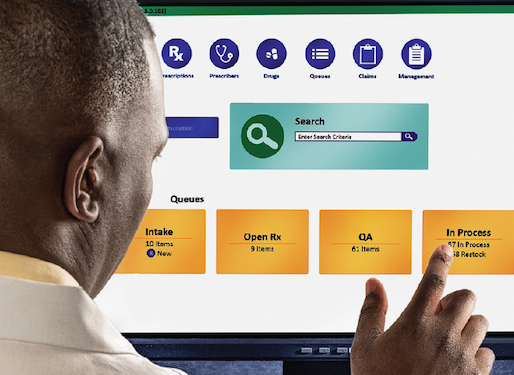 The software brings touchscreen capability, allowing pharmacists to quickly navigate through the system, and extensive reporting features built on SQL-database architecture. “Pharmacists need to do everyday tasks as quickly as possible. SharpRx gives pharmacies the tools to immediately begin processing prescriptions faster than ever before,” stated Tammy Devine, president of QS/1. In addition, SharpRx works with current off-the-shelf equipment — such as printers, barcode readers and scanners — already installed in pharmacies, QS/1 said. The solution, too, includes an array of productivity tools, such as eligibility checking, prior authorization, price updates, PMP reporting, clinical updates with drug images and imprints, prescriber updates and remote backup. Also this week, QS/1 announced it has received certification from Heartland Payment Systems to process EMV chip credit cards. QS/1 reported that this is one of the first integrated point-of-sale solutions with EMV security standards available to the small chain and independent pharmacy sector. The certification enables QS/1 customers using Heartland Payment Systems and QS/1-verified processing hardware to accept and authenticate the EMV (Europay, MasterCard and Visa) chip cards. QS/1 noted that with the transition to more secure chip cards, the financial liability has shifted to merchants not EMV-compliant in cases where a counterfeit chip card is used for a fraudulent transaction at a terminal that only accepts a card with a magnetic strip. Meanwhile, the revamped QS1.com brings a bright new look and improved navigation, along with industry news, product information and testimonials.